It’s always fascinating to look at antique fashion photos taking note of the styles and the details embellishing the garments. These two ladies demonstrate the latest fashion worn in the latter part of the 1870s. 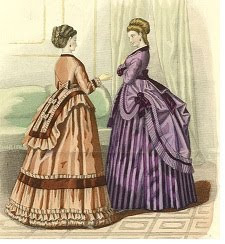 The dresses had some fullness overall but the bustle in the back gave the dresses the typical shape of the day. 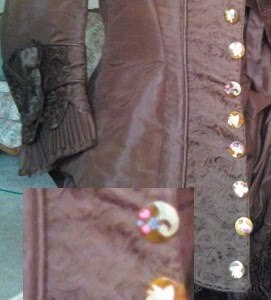 Note that not only is the back of the dress fuller but that added decoration brings attention to that fullness. You may wonder how the bustled dress stayed in place and draped so well. 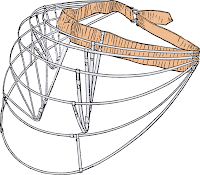 The illustration to the right shows the cage style that was made with materials like wire or cane. 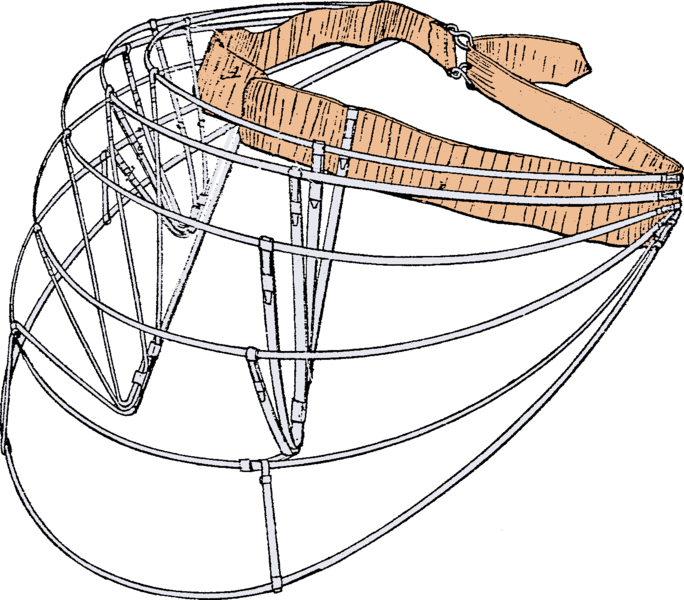 Other bustles consisted of muslin puffs boned to give the shape. Lighter bustles were simply be made of stiffened ruffles. It’s a special treat to examine an actual dress to see how it was made and to enjoy each detail that makes the dress special. I had the chance to do this when I was visiting antique dealer Mary Babcock. This dress is a wedding dress probably worn in the mid to late 1870s. Although some women wore the white bridal dress made popular by Queen Victoria’s wedding in 1840 many still opted for a dress that could be worn on other occasions as well. Dark colors like seen in this brown dress were in favor. The jacket made the dress even more versatile. 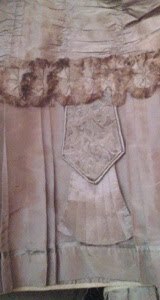 This dress is made primarily of solid fabric while monochromatic damask is used to add interest. 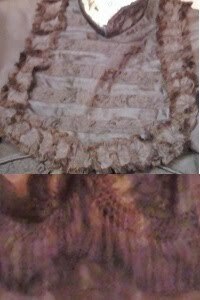 The photo below is of the style of bustle that was in fashion in the 1880s It's fun to see the difference.